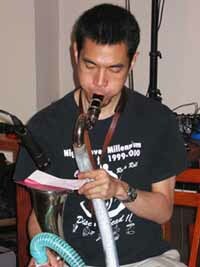 Masahiko Okura started performing in public venues around Tokyo in 1994, after joining the techno-noise band Dub Sonic Warrior. The other members of the group were Dub Sonic (machines and effects), and Shunichiro "Mittaco" Mimura (guitar). (Okura left the band in 1997.) At about the same time he also formed the band Sun King with Tadahiko Kanai (sax), Takashi Takeoka (bass) and Tadashi Matsumoto (drums). Throughout 1996, Okura often played at Uplink Factory in Shibuya, Tokyo, as a member of Dub Sonic Roots (the expanded version of Dub Sonic Warrior). The other group members were Dub Sonic, Tomohide Midori (sax), Masaaki Kikuchi (bass, electronics), Masaaki Taniguchi (voice), Tadashi Matsumoto (percussion), Maru (percussion) and others. That same year, Okura launched two duo projects, one with Kikuchi and the other with Akaiwa (electronics). He also joined Midori's big band, New Grass, which played mainly at jazz clubs. In 1997, a very important year for Okura, he formed his two bands: the electric jazz rock group GNU with Yoji Ishii (electric guitar), Taiji Takahashi (electric bass), and Guamu Kumada (drums); and the acoustic band Shida with guitarists Takashi Takeoka and Ueoka, and percussionist Heita Iwamoto. In that year he also started a duo with guitarist Taku Sugimoto. In May of '98 the duo played at concerts in New York and Chicago with local musicians such as Jim O'Rourke (guitar) and Kevin Drumm (prepared guitar).